Create a unique dessert bar at your baby shower or birthday party with Wild Safari Dessert Cupcake Toppers. This do-it-yourself kit includes clear treat picks and fun shaped cut outs. Simply attach each double-sided paper cut out to a clear plastic pick with the included clear stickers. Dessert Cupcake Toppers look great on standard cupcakes or add them to other baked goodies such as brownies or donuts. Other appetizers and miniature fruit kabobs are also easy to make with these fun food picks. 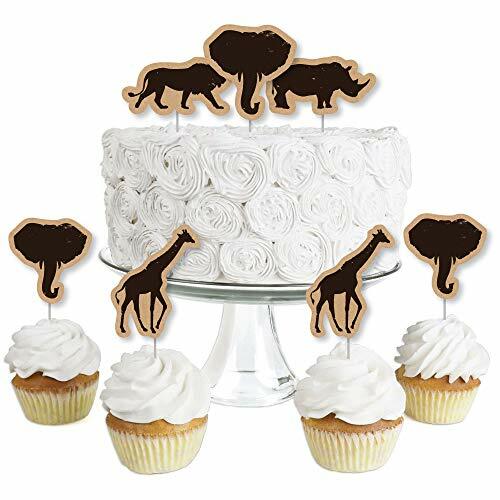 Get creative and bring all your party ideas to life with Wild Safari Dessert Cupcake Toppers. Wild Safari Dessert Cupcake Toppers INCLUDES 24 clear treat picks, 24 shaped paper cut outs and stickers for easy assembly. DIY Wild Safari cupcake supplies are perfect for a baby shower or birthday party. Plastic clear treat pick SIZE 4 inches tall with the completed height of the Wild Safari Dessert Cupcake Topper depending on where the plastic pick is attached to the shaped paper cut out. Cupcake toppers are perfect for standard cupcakes and can also be added to appetizers and individual servings of other sweet treats such as brownies or donuts, and even used to create small fruit kabobs. EASY PARTY DECORATIONS: Wild Safari Baby Shower or Birthday party picks make it easy to style an African jungle adventure theme party. Create impressive cupcake towers with decorated treats placed on a tiered stand at the candy buffet table, style adorable tables with individual cupcakes at each place setting, or make creative centerpieces using decorated treats and a coordinating treat stand. PREMIUM PARTY SUPPLIES: Clear treat picks are made of food-grade plastic and packaged in a food-safe environment. The Wild Safari paper cut out toppers are professionally printed on heavy-duty cardstock paper with themed art on one side and a coordinating pattern on the back. Cut outs will quickly attach to the clear dessert pick and then easily insert into your party appetizers or desserts. EASY ASSEMBLY INSTRUCTIONS INCLUDED: Clear treat picks and Wild Safari shaped cutouts will ship with easy assembly instructions to create unique dessert cupcake toppers.